Are Multilateral Banks Still Fit for Purpose in their Present Form? IDFC Institute Conversations hosted a private roundtable with Mr. Leslie Maasdorp, Vice-President and Chief Financial Officer, New Development Bank, for a discussion on "Are Multilateral Banks Still Fit for Purpose in their Present Form?" The discussion revolved on the design principles of the BRICS New Development Bank (NDB) and probed the areas of the business model of multilateral banks which require urgent reform, in order to enhance the effectiveness of these institutions in delivering infrastructure finance. Mr. Maasdorp elaborated on why the NDB was formed, i.e. the geopolitical, geoeconomic and socio-historical reasons for its emergence. He emphasised critical design principles of banks' business models such as a focus on sustainability, local currency funding, and agility and flexibility of these networks to adapt to changing environments. While speaking about NDBs in developing countries, Mr. Maasdorp referred to the platform as a voice and representation of its people, and as a structure for sovereign lending, co-specialisation of services, securitisation of assets and financial innovation. Hence developing best practices (eg: 'green finance') across countries is necessary to quantify tangible and intangible problems, harmonise safegaurds to shocks and hedge against unforeseen distortions. Thus, in a nutshell, encouraging new models and reforming old models of multilateral banks contain huge benefits to accelerating the impacts of development. Watch his video interview with IDFC Institute's Senior Associate Meenaz Munshi, below. 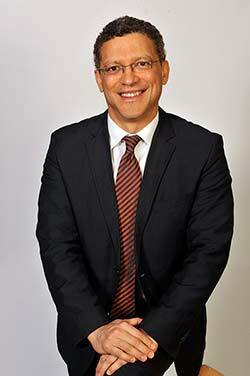 Mr. Leslie Maasdorp was appointed as Vice President and CFO of the BRICS New Development Bank in June 2015. Over the past 25 years, he has occupied senior leadership roles in both private and public sector in South Africa. Most recently he was President of Bank of America Merrill Lynch for the Southern Africa region for four years. Prior to this role, he served as Vice Chairman of Barclays Capital for Africa. In 2002 he became the first African to join the international advisory board of Goldman Sachs, a role he occupied for five years. After the transition to democracy in South Africa in 1994, Leslie was appointed Special Adviser to the Minister of Labour. As Deputy Director General of Department of Public Enterprises, he led the restructuring and privatisation program of the SA Government. Leslie was a prominent political activist during the anti apartheid struggle in SA playing leadership roles in the student and youth movement. During this time he was detained without trial for 15 months at Victor Verster Maximum Prison. After the unbanning of the ANC, he joined the Department of Economic Planning of the ANC as an economic policy adviser. He holds a B.A. degree in Economics and Psychology from the University of the Western Cape and an M.Sc. degree in Economics from SOAS, University of London.